Toronto — As part of the inspiring possibilities that World Pride has generated, Toronto is rolling out the rainbow carpet for those wishing to get hitched. Along with the grand mass wedding planned at Casa Loma, and the “I Do at the Carlu” event, Toronto Botanical Garden (TBG) is hosting a free group wedding of intimate proportions within nature’s warm embrace. All LGBTQ lovebirds planning to renew their vows or make their commitment official are invited to participate in a group wedding ceremony on Wednesday, June 25 at 3 p.m. The ceremony takes place in a new outdoor venue guaranteed to flaunt the rainbow colours of nature, TBG’s Perennial Border. For those wishing for a personalized wedding experience surrounded by nature’s beauty and a supportive community, this event is for you. Pre-registration is required for couples, as capacity is limited (max. 20 couples). 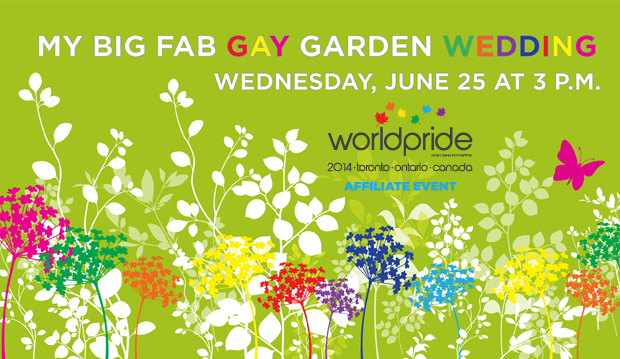 An application form is available online at www.torontobotanicalgarden.ca/bigfabgaywed. Once confirmed, a wedding planner from Imprint Weddings is available to guide couples through the process. From handheld bouquets to large-scale installations, a BIG FAB team of Toronto’s top florists, including Berries & Blooms, eco| stems, Opening Night Flowers and Sweetpea’s, bring the wow factor through stunning floral combinations. Personalized, eco-friendly bouquets and boutonnieres are provided for each couple. The BIG FAB photographer from Kate Hood Photography is onsite to capture the I do’s, along with a social media concierge who shares TBG’s Pride with the world. A stylish, festive and FAB outdoor reception follows the ceremony sponsored by a trio of caterers, à la Carte Kitchen, Eatertainment and en Ville. To add a lasting legacy, Toronto Botanical Garden is planting a Venus dogwood tree to mark this special occasion. All guests will be asked to write love notes and personal wishes on white cards to tie onto the “wish tree”. The wish tree concept was first created by Yoko Ono as an interactive installation for peace and has been reinterpreted by cultural institutions all over the globe. Toronto Botanical Garden offers an array of 17 award-winning themed gardens spanning nearly four acres designed to educate and inspire. You’ll also find a complete range of year-round, innovative, indoor and outdoor learning experiences for all ages, including programs, courses, classes, lectures, concerts, organic farmers market, garden tours, nature day camps and so much more. Our LEED Silver-Certified Building, with its energy-efficient sloping green roof, houses Canada’s largest private horticultural library, unique rental facilities and Garden Shop.